This detailed astronaut photograph features two stratovolcanoes—Pico de Teide and Pico Viejo—located on Tenerife Island, part of the Canary Islands of Spain. Stratovolcanoes are steep-sided, typically conical volcanoes formed by interwoven layers of lava and fragmented rock material from explosive eruptions. 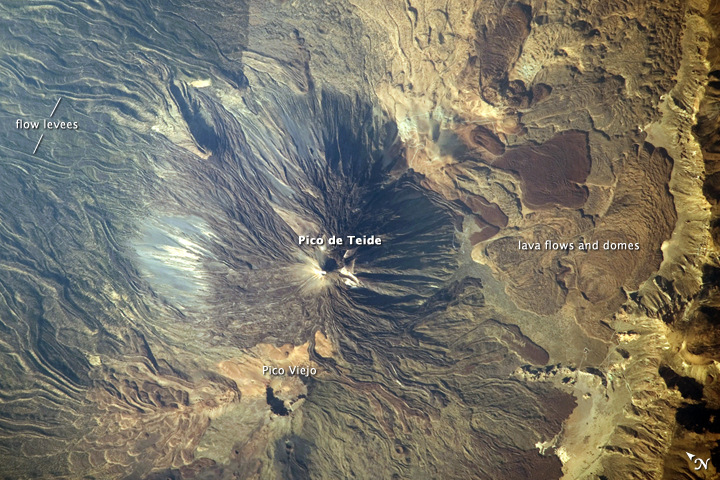 Pico de Teide has a relatively sharp peak, whereas an explosion crater forms the summit of Pico Viejo. The two stratovolcanoes formed within an even larger volcanic structure known as the Las Cañadas caldera. A caldera is a large collapse depression usually formed when a major eruption completely empties the magma chamber underlying a volcano. The last eruption of Teide occurred in 1909. Sinuous flow levees marking individual lava flows are perhaps the most striking volcanic features visible in the image. Flow levees are formed when the outer edges of a channelized lava flow cool and harden while the still-molten interior continues to flow downhill. Numerous examples radiate outwards from the peaks of both Pico de Teide and Pico Viejo. Brown to tan overlapping lava flows and domes are visible to the east-southeast of the Teide stratovolcano. Increased seismicity, carbon dioxide emissions, and fumarolic (gas and smoke) activity within the Las Cañadas caldera and along the northwestern flanks of the volcano were observed in 2004. 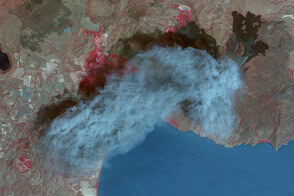 Monitoring of the volcano to detect renewal of activity is ongoing. Astronaut photograph ISS020-E-21140 was acquired on July 15, 2009, with a Nikon D3 digital camera fitted with an 800 mm lens, and is provided by the ISS Crew Earth Observations experiment and Image Science & Analysis Laboratory, Johnson Space Center. 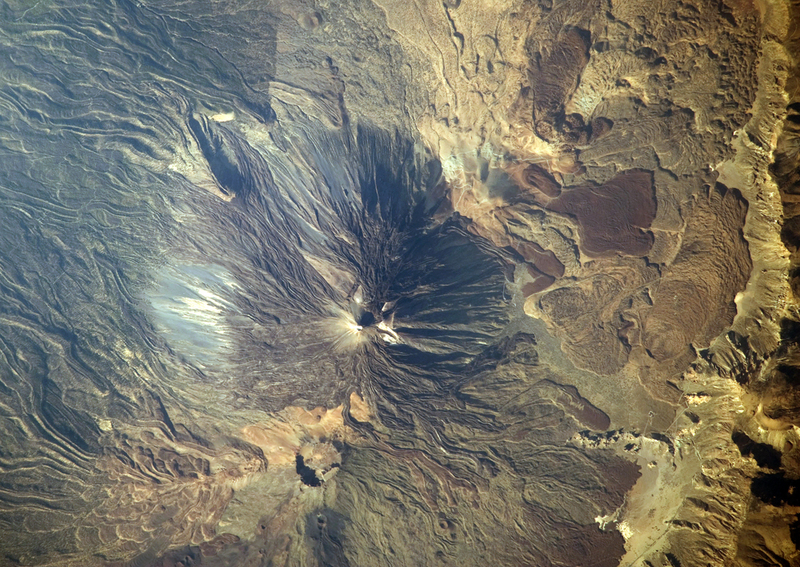 The image was taken by the Expedition 20 crew. The image in this article has been cropped and enhanced to improve contrast. Lens artifacts have been removed. The International Space Station Program supports the laboratory to help astronauts take pictures of Earth that will be of the greatest value to scientists and the public, and to make those images freely available on the Internet. Additional images taken by astronauts and cosmonauts can be viewed at the NASA/JSC Gateway to Astronaut Photography of Earth. Caption by William L. Stefanov, NASA-JSC. Sinuous, channelized lava flows are the most striking volcanic features visible in this astronaut photo of Teide and Viejo Volcanoes on Tenerife Island.